Here’s a quick recap from last night’s meeting in case you were’t able to attend. Also, the MP3 will be up later today, and it’s only 30 minutes long, so you may want to check it out! Mayor Curtis issued a proclamation recognizing and honoring Daniel Madriaga. Daniel Madriaga will become the 3rd karate Master in Greenville County and the 1st in Simpsonville. This is a high honor for him, his schools and the City of Simpsonville. His schools will have a Belt Promotion Ceremony on July 23, 2016, and the students and parents will be recognizing him for reaching such a high goal. The Leadership Simpsonville Class of 2016 was again present at our meeting to give some additional information about their upcoming projects. Check them out on Facebook here for additional info. Council voted unanimously to approve these projects. Council voted unanimously to charge City Administrator David Dyrhaug with developing a strategic action plan for ongoing community and economic development. Read more here. Council voted 4 (Gooch, Hulehan, Cummings, Curtis)-3 (Graham, Braswell, Lockaby) to approve on 1st reading Ordinance 2016-03, which is the ordinance commonly referred to as “Council Rules.” We’ve been working on this since the first of the year. The next vote will take place at the August business meeting. The Sewer Loan was moved to an upcoming meeting because it requires more analysis per City Administrator. Council voted unanimously to appoint Mr. Jay Crawford as Public Works Director. Mr. Crawford has been serving as Interim Director since January, and he’s been doing a great job. We are lucky he’s willing to take on this role permanently. Council voted unanimously to approve the appointment of Ms. Christine Furino as City Treasurer for the remainder for the current term of office (ending December 31st, 2017). Ms. Furino recently accepted the job as Finance Director. Ms. Furino has been with the City of Simpsonville since late 2013 as the City’s Senior Accountant Supervisor. We are grateful she is willing to serve in this additional role. At the last Committee of the Whole meeting, I mentioned that the Municipal Association of South Carolina (MASC) would soon be announcing economic development grants, which is one reason I think a strategic plan for economic development is critical. Well, just recently we received information from MASC that those grants are now available, and they’re accepting applications through September 30th. So it’s very timely that tonight we’re voting to get started on a strategic plan for ongoing community and economic development. Assets including, but not limited to, publicly-owned water or sewer projects; wayfinding signage or placemaking projects. Here’s another key point: matching funds are required. Until recently, we have not had any funds dedicated to economic development. But, as you, know, recently, a group of business and community leaders changed that by donating the first funds to be devoted to economic development in Simpsonville. We hope to grow those dollars. Doing so will set us up for future success in securing grants like this. And make no mistake: this is only one example of funding that we could be eligible for if we have a commitment to economic development and a strategic plan in place for ongoing community and economic development. Read previous posts on economic development here. See below for the press release regarding this morning’s presentation. SIMPSONVILLE, SOUTH CAROLINA, (June 29, 2016) – Local business owners and citizens presented a check for $1,000 to Mayor Janice Curtis and the City of Simpsonville to be contributed to an economic development line item in the City’s budget. Rory Curtis, owner of Carolina Olive Oil, spearheaded the movement to gain support from local businesses. “ I approached several people with the idea of donating towards the City’s economic development. The response was overwhelmingly positive. We are proud to do business in Simpsonville and are eager to support economic development in our city” said Mr. Curtis. For decades Simpsonville has been growing both commercially and residentially. However, there has never been a designated line item in the City’s budget for econmic development. “Simpsonville is one of the state’s fastest growing cities. Businesses are attracted to Simpsonville because our community ranks among the highest income and education levels in the state. Families want to live in Simpsonville because we are a safe, family-friendly community with great schools and parks. Having this newly created line item in our budget shows that Simpsonville is committed to economic development” said Mayor Curtis. According to Mr. Curtis, the money is being donated with “no strings attached.” The goal of the donation is to continue the conversation of econmic development in Simpsonville with a focus on revitalizing the downtown area. There are several small projects that can make a big impact on Main Street, Simpsonviille. The City of Simpsonville will seek to grow the account by pursuing grants and in future budgeting efforts. “The heart of our community is its people. The private public partnership initatied by these community leaders is unprecedent and truly represents One Simpsonville. The business community, the citizens, and the City are working together for the future of Simpsonville” said Mayor Curtis. The City of Simpsonville would like to thank the following individuals and businesses for their contributions. Lewis Stewart and Lewis Stewart, Jr.
First and foremost, I envision the future of the school as a place that is truly for the people, by the people, and of the people. What do the people want? What will most benefit them? How can they make use of the space to improve their lives? To this end, I think it’s great that Councilman Taylor Graham attended our concerned citizens meeting, recognizing that citizen input is key to determining the best possible usage of that building. I am happy that the city has some sort of plan for focus groups sometime in the future to get citizen feedback. Regardless of what we decide to do with the elementary school, I firmly believe we need access to the arts for all of our citizens and a stronger commitment to community and cultural programs and services. It is my opinion that the school offers us a unique opportunity as a place that could help us fulfill such a commitment. It’s there. It’s empty. We own it. We need to do something with it. Why not this? Imagine the school once again alive with the sound of children laughing, playing, learning. And imagine it weren’t just children. Imagine adults—people of all ages—laughing in the auditorium seats or singing on its stage; drawing, painting, or sculpting in studio classrooms; or browsing halls lined with the work of local & regional artists. Imagine them learning more about Simpsonville’s history during programs like those presented by the Simpsonville Museum of Revolutionary War Museum. Imagine them attending a book reading by a local author. These are just examples—the specifics of what could and would be offered there would be determined by the people. As I said originally, it would be something that is uniquely Simpsonville—something that encourages community pride for our citizens through arts and culture. So imagine a place that would enrich all of our lives and our community through a variety of cultural activities, through exposure to the arts, through a shared sense of community. That’s my vision. And it’s a vision that will yield multiple social and economic benefits to our city. 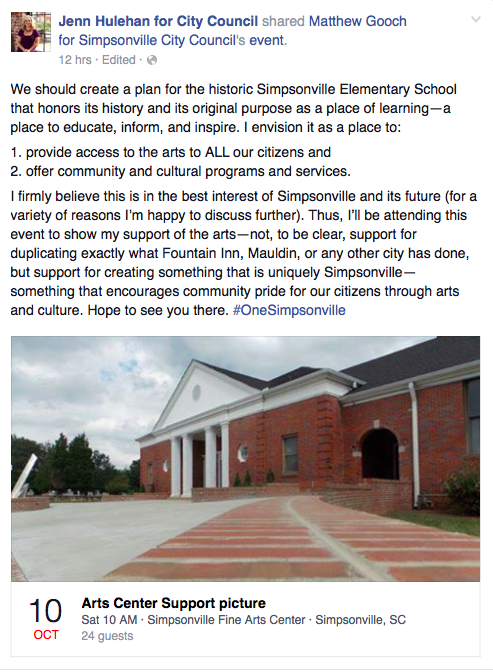 It’s a vision we can accomplish if we’re all working together towards the same goal: one better Simpsonville for all. “Are we moving in a direction that our children will be proud of?” According to former Davidson, NC Mayor Randall Kincaid, their city adopted a philosophy by which public officials asked this question before every decision. It’s brilliant because ultimately, that’s the job of city leaders: to create a future better than the present, to work steadily for continuous improvement, to create a city that our children will be proud to live, work, and play in years from now. It’s brilliant because it forces us to stop and consider the long-term goal or vision before making short-term decisions. And above all else, that’s what we need to do on city council. We need a vision. And we need people committed to making it a reality. We need people willing to ask, “Are we moving in a direction that our children will be proud of?” at every turn. I have a vision for Simpsonville that I think will make it, beyond a doubt, the kind of city our children and their children will be proud of. Support programs that educate, inform, and inspire through a variety of cultural activities. This will lead to economic development…because community development is economic development. Attract and support new businesses. But in order to do this, we need to work together. We need everybody on board. So we need to commit to creating unity and building partnerships. Then we can ask ourselves, “Are we moving in a direction our children can be proud of?” And answer ourselves with a resounding yes. Yes, we are moving in a direction our children will be proud of. 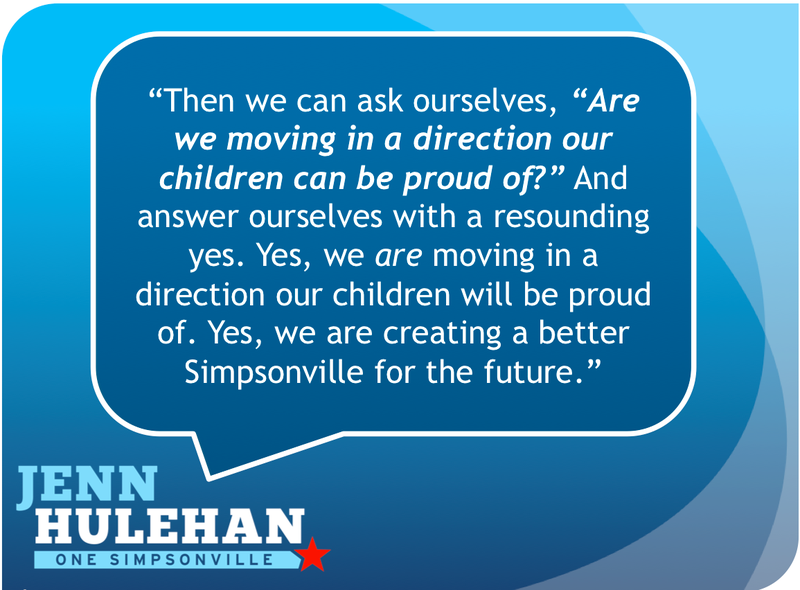 Yes, we are creating a better Simpsonville for the future. It’s time to get people on council who can do that. I think I’m just that kind of person. And that’s why I’m asking for your vote on November 3rd. I’ll give you the short answer here and invite you to come on out to Tea N Things on Monday evening for the meet the candidates event to talk about it some more. Hope to see you there! My vision for increasing economic development in Simpsonville relies on creating stronger partnerships between the city government, business owners, non-profit and community groups, etc. As Henry Ford once said, “If everyone is moving forward together, success takes care of itself.” We need everyone in Simpsonville on board. I believe the mayor and council should provide the vision and leadership to make that happen. Further, I believe that community development is economic development. And I believe that it starts (and is successful) when the city government has a broad vision for community & economic development to guide its decisions. Every decision should be preceded by the question, “how does this (or does this not) help us accomplish our long-term goal?” When potential businesses see a community thriving, they are naturally attracted to it. When they know that the city will help support them in becoming established as part of that community, they are more inclined to join the community. When they see everyone working together towards one shared goal: the betterment of the city, they know they will be successful, that we’ll all be successful, and are far more likely to choose Simpsonville as a place to start/open a business. When they see strong leaders with a clear vision, they want to be a part of that. Bringing arts and culture to Simpsonville starts with a vision—a vision that the city government should share and commit to. From there, specific planning can begin. That planning will need to include multiple stakeholders. I will say again that creating stronger partnerships between the city government, business owners, non-profit and community groups, etc. is incredibly important to achieving this vision. Establishing an Arts Center is a long-term goal. It won’t happen overnight. But it won’t happen at all if we do not have leaders committed to a vision that includes one. It will also not be something I alone do—it will be a team effort, and all good teams start with a shared goal. On raising taxes: We just had a tax increase. We need to avoid increasing taxes again. We also need to ensure that we maintain the first rate services we’ve come to expect in Simpsonville. These same services that make it enjoyable for us to live here also attract new residents and businesses. That’s good for the city. And we certainly can’t cut necessary services to fund an Arts Center; that would be irresponsible. I will say on a related note that I would like to see our departments adopt a zero-based budgeting (ZBB) model. In my experience (I have had to do this in my role as a department head in the public sector), ZBB creates a more efficient allocation of resources. This can help us “trim the fat” (if there is any), so that we can maintain those services without increasing taxes (this is true whether there’s an Arts Center or not). We need to be good stewards of taxpayer dollars. Again, I hope to see you at the Meet the Candidates event on Monday evening! Click here to register.